Last Sunday I reported on the arrival of the 31 Heroes sims and speculated widely that they may be something to do with the TV series , not that they are open to the public I see I was wrong – They are part of the ACS Relay for Life project . Well worth a visit as there are a lot of wonderful builds across the regions. 126 sims left the grid though 32 of these were just renames . Overall this is a slight increase on past weeks resulting in 76 estate regions going off line, growth though is still very positive . 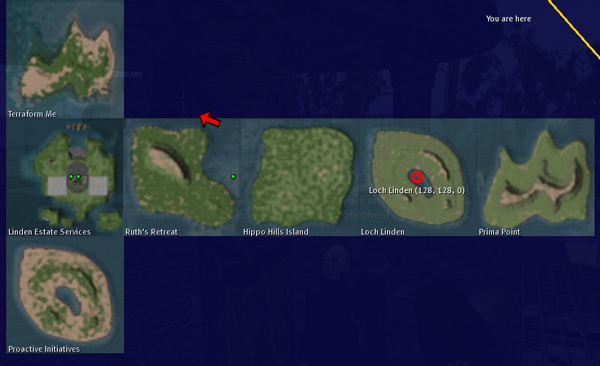 Included in the departed sims are 19 of the SL5B sims as well as renames of the example regions showing the 4 default islands available to order . These have now been given full names instead of the generic Island 1 , Island 2 etc, The new names have a distinctly Linden flavour – Ruth’s Retreat,Hippo Hills Island,Loch Linden, Prima Point along with the nearby test region now known as Proactive Initiatives … (if only :sigh: ) . They can all be foun in a little archipelago near the Linden Estate Services sim.